In honor of Christmas the kids and I made some apple wreaths for a fun snack one afternoon. First we sliced and cored our apple to make them into perfect little wreaths for decorating. We then gathered some toppings to decorated our wreaths with--nutella, dried fruit and cinnamon & sugar. My daughter decorated hers with thoughtfulness and care . . .
And my little mister made a wonderfully large mess. But he had fun. And that's what counts, right? No beautiful apple wreaths to show you in the end. Just a lot of fun--and a yummy treat too. Given that my oldest son and I are gluten-free, I just wanted to thank you for this idea! How cute! 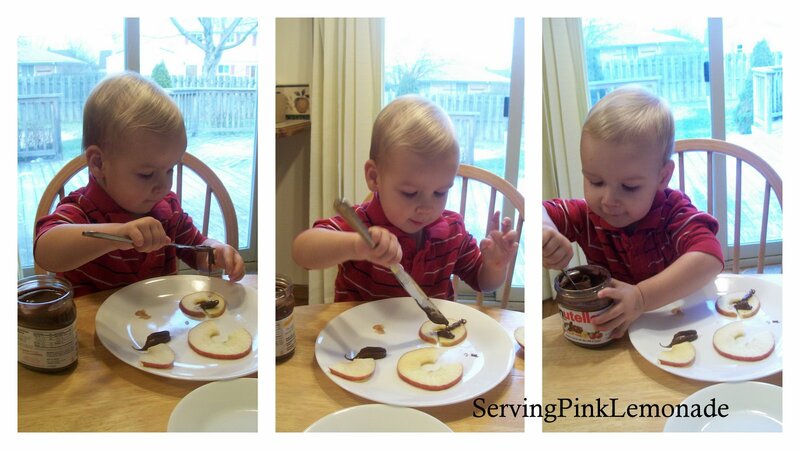 Healthy snack and a fun craft!